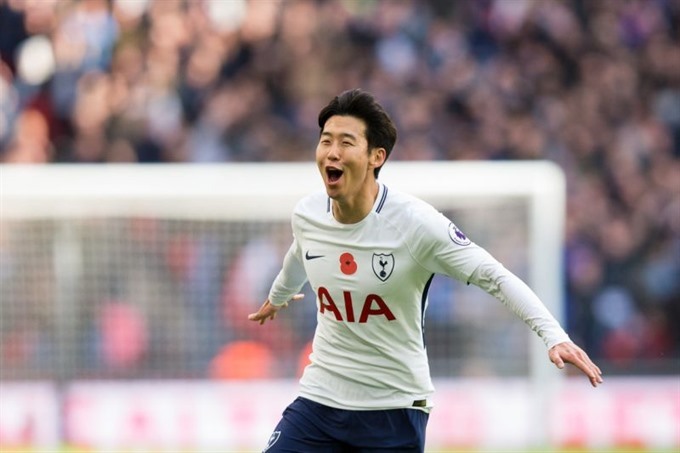 LONDON — Son Heung-Min’s second-half goal gave Tottenham Hotspur a nervy 1-0 Premier League victory over bottom club Crystal Palace in a London derby at Wembley Stadium on Sunday. But Mauricio Pochettino’s injury-ravaged side failed to hit the heights of Wednesday’s memorable 3-1 Champions League victory over Real Madrid and the title-chasers were fortunate to claim all three points. Spurs were without two goalkeepers in Hugo Lloris (thigh) and Michel Vorm (knee) so Paulo Gazzaniga came in for his debut. Toby Alderweireld and Dele Alli (both hamstring) were also sidelined, but Danny Rose made his first Premier League start since January. It was Palace who put Gazzaniga under immediate pressure as the Argentine failed to collect Wilfried Zaha’s cross but Mamadou Sakho failed to capitalise. At the other end, Harry Kane’s volley lacked the power to beat Palace keeper Julian Speroni. Harry Winks and Kane both received treatment for knocks and that disruption hampered the hosts’ bid to find their tempo. Tottenham did have most of the possession with Rose heading wide from Serge Aurier’s cross while Kane nodded off target after a deflected Rose cross had fallen nicely to him. Zaha’s pace caused Spurs’ defence problems but Eric Dier was equal to the task with a number of important interceptions. Spurs had further half chances before the break as Jan Vertonghen’s deflected 20-yard strike came close to deceiving Speroni while Son’s left-footed shot missed the target when the South Korean was well-placed. Mousa Dembele came on for a clearly struggling Winks after half-time, putting the midfielder’s participation for England’s upcoming friendlies against Germany and Brazil in doubt following Alli’s withdrawal from the national squad. It was Palace who started the second half the brighter with Andros Townsend bursting down the left before his shot was pushed away by Gazzaniga, who had started to grow in confidence in the home goal. The visitors, with just one previous victory to their name all season, really should have taken the lead as Aurier gave the ball away to Townsend. The Palace winger then fed Zaha, who rounded Gazzaniga, only to fire wide of an empty net. Gazzaniga then came to Tottenham’s rescue again as he kept out Luka Milivojevic’s header from Yohan Cabaye’s corner from point blank range. But just as it looked like Palace were getting in the ascendancy, Tottenham struck in the 64th minute. Sissoko’s cross was not properly cleared and Son delightfully picked his spot with a 20-yard left-foot shot that saw him score for the third time this season. Palace continued to cause problems for Spurs, especially down the left-hand side with Zaha unable to produce a finish after one such run. Cabaye also shot wide from 25 yards as Palace belied their position as the Premier League’s basement club. Kane was replaced by Fernando Llorente with 14 minutes to go, although he did not appear to have suffered majopr damage from an earlier knock. Palace continued to create chances, with Scott Dann heading wide from Cabaye’s corner, but Son really should have killed the game off when he dragged his shot into the side netting after being through by Vertonghen. Moments later Son was in again only for his lack of pace to let him down.